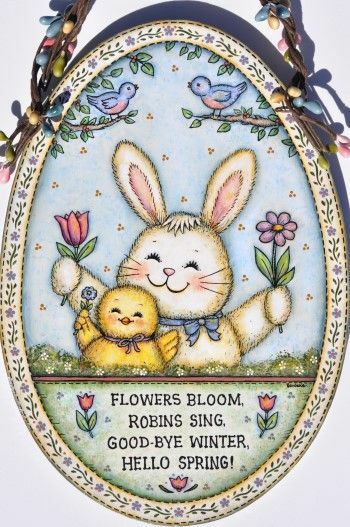 Featuring a happy bunny and chick holding flowers with the saying “Flowers Bloom, Robins Sing, Good-bye Summer, Hello Spring”. It is painted on a wooden egg shaped plaque measuring 8” x 5 1/2”. I made a hanger by weaving some spring colored pip berries onto a wire hanger or you could just put a hook on the back. This packet also includes 4 eggs with elements of the main design, “Bunny”, “Chick”, “Robins Sing” and “Bunny & Chick”. Patterns are included for both hen and goose size wooden eggs. 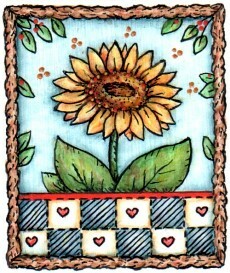 This packet contains: Complete directions, four colored photos and two full size pattern pages.